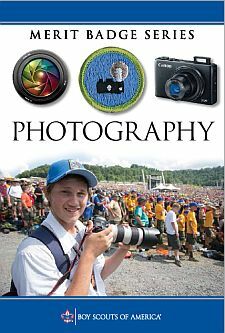 Explain to your counselor the most likely hazards you may encounter while working with photography and what you should do to anticipate, mitigate, prevent, and respond to these hazards. Explain how you would prepare for exposure to environmental situations such as weather, sun, and water. Explain the basic parts and operation of a film camera or digital camera. Explain how an exposure is made when you take a picture. Photograph one subject from two different angles or perspectives. Photograph one subject from two different light sources—artificial and natural. Photograph one subject with two different depth of fields. Photograph one subject with two different compositional techniques. Adjust the exposure or make a color correction. Show another way you could improve your picture for impact. Plan the images you need to photograph for your photo story. Share your plan with your counselor, and get your counselor's input and approval before you proceed. Select eight to 12 images that best tell your story. Arrange your images in order and mount the prints on a poster board, OR create an electronic presentation. Share your visual story with your counselor.